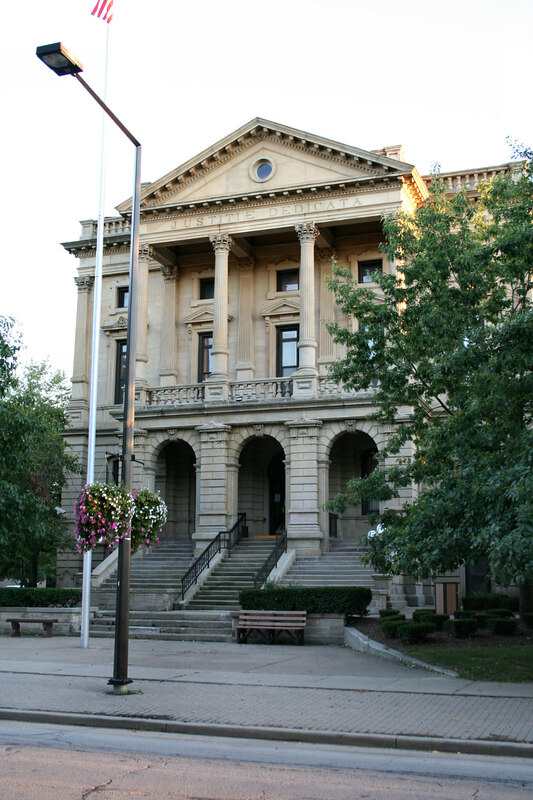 Elyria is a city in and the county seat of Lorain County, Ohio, United States, located at the forks of the Black River in the state's northeast. As of the 2010 census, the city had a population of 54,533. The city is named for its founder, Heman Ely, and the Greek name Illyria. The city is home to Lorain County Community College. This area was occupied for thousands of years by varying cultures of indigenous peoples. It began to be settled by European Americans after the American Revolutionary War, when demand for land drove settlers west along the Great Lakes from New York and New England. Elyria was founded along the Black River (Ohio) in 1817 by Heman Ely, who built a log house, dam, gristmill, and sawmill on the site. Ely began to build more houses to accommodate European-American settlers migrating to what was then called the Northwest Territory. By the time Ely died in 1852, Elyria had five churches, three grocery stores, three flour mills, a newspaper, and a population of more than 1,500. Early postal service from Cleveland was provided by Artemis Beebe, a rider who held the first contract to deliver mail across the Black River. 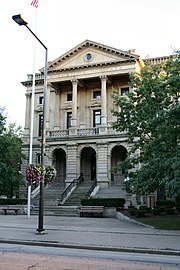 By the turn of the 20th century, Elyria was a small town of about 8,000. In 1908, Elyria Memorial Hospital was built. It has since evolved into an award-winning regional healthcare system. In the first half of the 20th century, the town developed some manufacturing, as well as a range of retail businesses. In August 1967, at the peak of Elyria's population, Midway Mall was opened. It changed the local economy by attracting local businesses from the town center or causing so much competition they went out of business. Industrial restructuring meant that good jobs left the area, and poverty increased. In the August 1975, tensions between Elyria's black community and the Elyria Police Department erupted in a riot after Officer Michael Killean shot Maxwell in the back, killing him. The outrage from Elyria's black community resulted in broad vandalism; buildings and shops were burned, particularly in the southern and western portions of the town, finally brought under control by State Guard troops during a 3-day patrol. Meanwhile, three major car plant closings in the area lead to economic stagnation and joblessness in the 1970s and 80s that affected numerous communities. The region was nicknamed "the Rustbelt," suggesting the decline of its former industries. In the 1990s, Elyria had a minor revival with construction of some new roads and housing. It serves as a residential, suburban "bedroom community" for Cleveland, located to the east, where new businesses and industries are developing with an increase in new jobs. Elyria, part of the Cleveland–Elyria–Mentor metropolitan area, is located at 41°22′24″N 82°6′6″W﻿ / ﻿41.37333, -82.10167 (41.373396, -82.101692). Elyria's primary zip code is 44035 with post office boxes being assigned the zip code 44036. According to the United States Census Bureau, the city has a total area of 20.84 square miles (53.98 km2), of which, 20.57 square miles (53.28 km2) is land and 0.27 square miles (0.70 km2) is water. The Black River flows through Elyria. As of the census of 2010, there were 54,533 people, 22,400 households, and 14,093 families residing in the city. The population density was 2,651.1 inhabitants per square mile (1,023.6 /km2). There were 25,085 housing units at an average density of 1,219.5 per square mile (470.9 /km2). The racial makeup of the city was 78.1% White, 15.5% African American, 0.3% Native American, 0.8% Asian, 1.2% from other races, and 4.1% from two or more races. Hispanic or Latino of any race were 4.9% of the population. There were 22,400 households of which 31.6% had children under the age of 18 living with them, 39.5% were married couples living together, 17.8% had a female householder with no husband present, 5.6% had a male householder with no wife present, and 37.1% were non-families. 30.5% of all households were made up of individuals and 10.5% had someone living alone who was 65 years of age or older. The average household size was 2.39 and the average family size was 2.97. The median age in the city was 38.1 years. 24.2% of residents were under the age of 18; 9% were between the ages of 18 and 24; 25.7% were from 25 to 44; 26.8% were from 45 to 64; and 14.3% were 65 years of age or older. The gender makeup of the city was 47.8% male and 52.2% female. As of the census of 2000, there were 55,953 people, 22,409 households, and 14,834 families residing in the city. The population density was 2,813.7 people per square mile (1,086.2/km²). There were 23,841 housing units at an average density of 1,198.9 per square mile (462.8/km²). The racial makeup of the city was 81.3% White, 14.2% African American, 0.27% Native American, 0.61% Asian, 0.02% Pacific Islander, 0.95% from other races, and 2.64% from two or more races. Hispanic or Latino of any race were 2.78% of the population. There were 22,409 households out of which 31.9% had children under the age of 18 living with them, 46.4% were married couples living together, 15.1% had a female householder with no husband present, and 33.8% were non-families. 28.5% of all households were made up of individuals and 10.6% had someone living alone who was 65 years of age or older. The average household size was 2.46 and the average family size was 3.01. In the city the population was spread out with 26.6% under the age of 18, 8.9% from 18 to 24, 30.2% from 25 to 44, 21.3% from 45 to 64, and 13.0% who were 65 years of age or older. The median age was 35 years. For every 100 females there were 92.4 males. For every 100 females age 18 and over, there were 88.7 males. The median income for a household in the city was $38,156, and the median income for a family was $45,846. Males had a median income of $34,898 versus $24,027 for females. The per capita income for the city was $19,344. About 9.5% of families and 11.7% of the population were below the poverty line, including 19.0% of those under age 18 and 7.5% of those age 65 or over. Elyria is served by Elyria Memorial Hospital. Ely Park fountain and Civil War memorial. Elyria has a large number of parks and recreational centers that include a variety of activities such as baseball, playground equipment. The four recreational centers are named after their location on the map - North, East, South, and West. They each include one or more baseball fields and at least two tennis courts. There are two main parks, Cascade and Elywood, which are connected by a drive-on ford in the center. Cascade Park is the largest and most popular park in Elyria. The park is located in a ravine carved by the same glaciers that created the Great Lakes. Cascade park has a large playground and a large hill used for seating at the 4th of July fireworks show, and is a popular spot for sledding during winter months. The park is centered along the Black River. The park used to have three captive black bears, held in cages attached to a rock. Bears were featured in the park from 1920 to 1980. Elyria is home to many businesses and several worldwide headquarters. Invacare, the Ridge Tool Company, Diamond Products, Bendix Commercial Vehicle Systems, and EMC Precision Machining are all headquartered in Elyria. Riddell operates a factory in Elyria. Elyria Plating Corporation has been in the same location since 1937. Elyria has a large number of public and private schools including Elyria High School. The Elyria City Schools district consisted at one time two high school, three junior high schools, nine elementary schools, and one kindergarten school. Elyria is also home to Elyria Catholic High School. In 2010 Elyria High School was torn down for plans to build a new one. Lorain County Transit is based in Elyria. Elyria is served by many highways, including U.S. Route 20, the Ohio Turnpike, and State Routes 2, 113, 301 and 57. The general airport for Elyria and Lorain is the Lorain County Regional Airport (located in New Russia Township), and Cleveland-Hopkins International Airport is the nearest major airport. The Elyria Amtrak Station provides train transportation. The film Take Shelter includes a scene in which Michael Shannon enters the Elyria Main branch library and looks for books. The character of Officer Richard Lymangood, in the film Blue Thunder, was born in Elyria, according to the helicopter terminal database. Sherwood Anderson, writer, lived and worked here as owner of a business for a time in the early 1900s, before abandoning his business and family in 1912. Chad Szeliga, drummer for Breaking Benjamin. ^ Gannett, Henry (1905). The Origin of Certain Place Names in the United States. Govt. Print. Off.. pp. 118. http://books.google.com/books?id=9V1IAAAAMAAJ&pg=PA118#v=onepage&q&f=false. ^ "Greetings from ELYRIA, OHIO: History". Elyriapride.elyria.com. http://elyriapride.elyria.com/ehistory.htm. Retrieved 2012-10-13. ^ Mancine, Benjamin (2004). Elyria in Vintage Postcards. Chicago, Illinois: Arcadia Publishing. ^ Roberson, Lisa (8-7-2012). "Demolition to begin Monday at Elyria High School". The Chronicle Telegram. This page uses content from the English language Wikipedia. The original content was at Elyria, Ohio. The list of authors can be seen in the page history. As with this Familypedia wiki, the content of Wikipedia is available under the Creative Commons License.